Banked Track Roller Derby in San Diego!!! Tomorrow night will go down in history. It will be the first banked track roller derby bout in over 30 years at the Del Mar Fairgrounds. 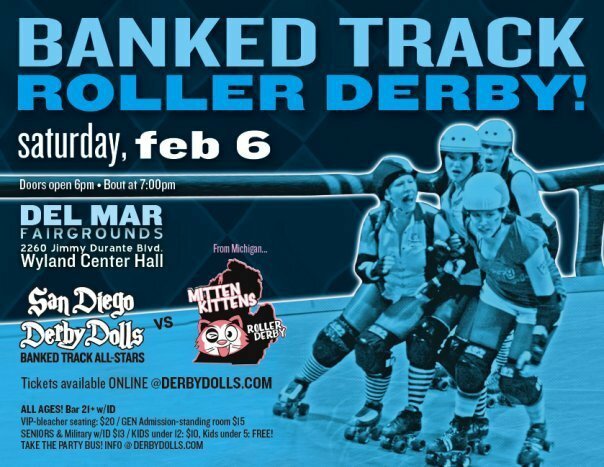 At 7 p.m. in Wyland Hall, over 1,800 people will witness the San Diego Derby Dolls Banked Track All-Stars taking on the Mitten Kittens from Michigan on their shiny new track. The Mitten Kittens are a team of skaters from several leagues in Michigan that also includes nationally qualifying speed skaters in the mix (who also happen to play derby). Some of them have also had experience on a banked track as extras from the movie, Whip It! Tickets are going fast (bleachers seats are almost gone and the party bus from Bluefoot is already sold out). The cut off for online sales is at 6 a.m. Saturday morning. If you want to be a part of history, get your tickets NOW! Here is Cherry Blue in all her glory, named for Cherry Punch, who made this track happen. It was Cherry who worked countless hours and whose sweat and blood was sacrificed. The blue stands for the turquoise blue that is the San Diego Derby Dolls. The padded uprights and rails will be covered in black and blue fabric in its final touches. Cherry Blue will be stored onsite at Del Mar in a movable storage unit. It will take 4-6 hours to set up before a game and 4-6 hours after. If you are interested in being on this crew cause you love us so much, contact our bout production coordinator at SDEvents@derbydolls.com. je souhaiterais connaitre le constructeur et fournisseur de cette piste de derby?